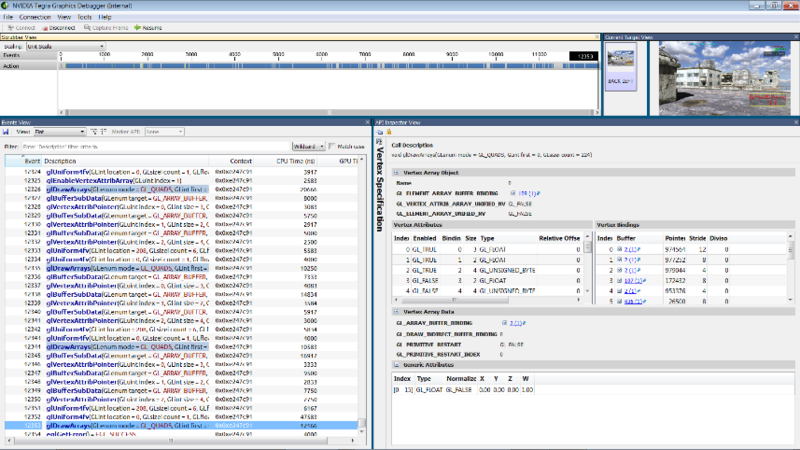 Tegra Graphics Debugger is a console-grade tool for debugging and profiling OpenGL1 and Vulkan applications from a Window, OSX, or Linux host computer. Built specifically for Tegra K1 and X1 SOCs with Kepler class GPUs, Tegra Graphics Debugger shares a similar look and feel with NVIDIA Nsight Visual Studio Edition. 1 OpenGL 4.3-4.5, OpenGL ES 2.0-3.1 + Android Extension Pack supported. Linux for Tegra support is available under the NVIDIA Jetson Embedded Platform. Download the latest version of NVIDIA Tegra Graphics Debugger for Android in the CodeWorks for Android installer. NVIDIA Tegra Graphics Debugger is offered free of charge, but requires NVIDIA GameWorks™ Registered Developer Program membership. Standalone Tegra Graphics Debugger downloads are also available at the NVIDIA GameWorks™ Download Center. Identify performance bottlenecks and GPU utilization. Tegra Graphics Debugger allows you to quickly connect to an Android devkit or a device powered by Tegra K1, Tegra X1, or Tegra X2, and attach to your graphics mobile application to monitor key software and hardware performance metrics, such as "frames per second" to gauge rendering performance and "GPU utilization" to ensure you're taking full advantage of the hardware. Simple, yet effective, directed tests provide a painless method for identifying application bottlenecks. The Frame Debugger captures a rendered frame from your mobile application for further analysis and debugging. Powerful tools, such as the Scrubber and Events Views, allow you to navigate the massive amounts of data generated by your application. Other views, such as the Resources View, allow you to explore your application, examining the various assets, while the API Inspector provides a view into the internals of your application. The Range Profiler View uses hardware performance monitors to measure unit utilization and bottlenecks, reporting the performance limiters for the rendered frame. The high level overview shows where compute cycles are spent and how much memory traffic is happening where. This gives you a basic idea of how efficient your application is. Additionally, you can group draw calls that share similar state, like rendering to the same buffer or using the same shader, capitalizing on your optimization efforts giving a maximum bang for your buck. With Tegra Graphics Debugger, you can edit and recompile graphics shader source code on the fly, allowing you to experiment with modifications to your shader source for both performance and debugging. These modifications can easily be toggled or updated to compare rendering or performance results in conjunction with directed tests. Tegra Graphics Debugger's powerful workflows enable game and graphics developers to get the most out of Tegra K1, Tegra X1, and Tegra X2 SOCs. Hosted on Windows, OSX and Linux, and targeting all Tegra operating systems (including Android and Linux for Tegra), this tool for modern graphics development fits easily into your development environment. Redefine next-gen with NVIDIA Developer Tools. To provide feedback, request additional features or report support issues, please use the Tegra Developer Forums.